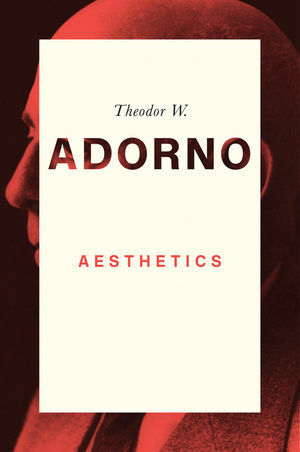 This volume of lectures on aesthetics, given by Adorno in the winter semester of 1958–9, formed the foundation for his later Aesthetic Theory, widely regarded as one of his greatest works. The lectures cover a wide range of topics, from an intense analysis of the work of Georg Lukács to a sustained reflection on the theory of aesthetic experience, from an examination of works by Plato, Kant, Hegel, Schopenhauer, Kierkegaard and Benjamin, to a discussion of the latest experiments of John Cage, attesting to the virtuosity and breadth of Adorno's engagement. All the while, Adorno remains deeply connected to his surrounding context, offering us a window onto the artistic, intellectual and political confrontations that shaped life in post-war Germany. This volume will appeal to a broad range of students and scholars in the humanities and social sciences, as well as anyone interested in the development of critical theory. Theodor W. Adorno (1903-1969), a prominent member of the Frankfurt School, was one of the most influential thinkers of the 20th century in the areas of social theory, philosophy and aesthetics. Does art merely express what has been destroyed? Interpretation of the Phaedrus, contd. "Adorno's lectures provide a fascinating glimpse into the philosophical workshop where his ideas were forged and developed, and this lecture course on aesthetics from the late 1950s is no exception. With an irrepressible sense of intellectual adventure, Adorno argues with the giants of the German tradition in the philosophy of art, interprets Plato's theory of beauty in the Phaedrus, and struggles to make sense of the music of John Cage. He offers a virtuoso series of variations on his central claim that, in art, we experience reason 'in the form of its otherness', as a 'particular resistance' to the instrumental rationality which dominates our lives." "These lectures are much more than an early record of Adorno's path toward his late, uncompleted masterwork, Aesthetic Theory. They represent an independent and often revelatory statement of his thinking on aesthetics in the late 1950's. This book is an indispensable addition to the English-language reader's understanding of this central thinker."